South Aral Sea's basin is now "completely dried." 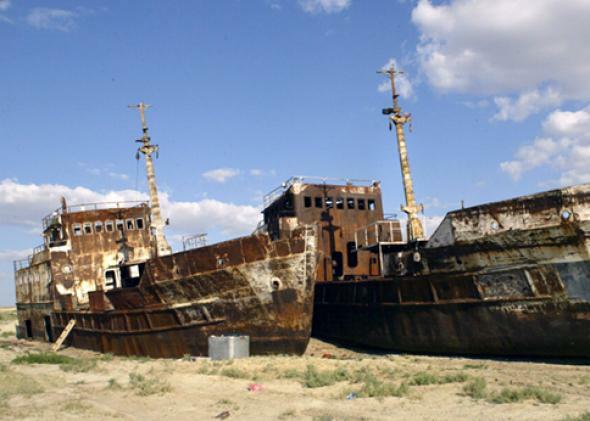 A picture taken August 4, 2005, shows rusty shipwrecks where the Aral Sea once was. The Aral Sea—a huge part of it at least—is no more. In the early 1900s, the Aral Sea was the fourth largest lake in the world. It has been dwindling since the 1960s, when a Soviet program of irrigated agriculture diverted the region’s major two rivers, the Amu Darya and the Syr Darya, largely to grow lucrative but water-intensive cotton. Sound familiar, California? Since the Soviet Union dissolved, things have only gotten worse. According to a report (PDF) by the United Nations Environment Programme, more than 60 million people now live in the Aral region, up fourfold since 1960. At the same time, inflows into the lake are down sharply, a phenomenon possibly linked to climate change. With the help of the World Bank, in 2005 Kazakhstan built a dam as a last-ditch effort to save part of the lake, with mixed results. According to NASA, this year’s final push toward record-low lake levels came as a result of low snowpack in the mountains that feed the lake. This isn’t a story of climate change, though. It’s a story of barreling ahead with the status quo amid a superfluity of stop signs. Rice and cotton fields are still widespread in the Aral region, though oil and gas exploration in the dry lakebed is becoming more common, too. Without the steadying influence of the lake on local weather, winters in the surrounding region are now colder, and summers are hotter and drier. Blowing dust, laced with agricultural chemicals that have built up as a result of runoff into the lake over the years, has contaminated surrounding communities. This is not a place you’d want to live. The tragedy of the Aral Sea should be a cautionary tale for people in the increasingly water-scarce American Southwest. After all, we have our own fair share of Aral Seas here, too. About 100 years ago, eager California farmers drained Lake Tulare, then the largest freshwater lake west of the Mississippi. More recently, Hoover Dam’s Lake Mead, now at record-low levels, has lost its title as the biggest reservoir in the country. (As of February of this year, it had fallen all the way to fourth.) Lake Shasta, the largest reservoir in California, is starting this year’s rainy season at only 26 percent of total capacity. There’s tenuous hope that California is finally starting to recognize the dire situation the mix of agriculture, urban growth, and climate fluctuations have put them in before it’s too late. California’s legislature recently passed a series of measures that will regulate groundwater pumping, the last Western state to do so. Last week, the governor signed the bill into law. As for the desiccating Aral region, there’s nowhere to go from here but up.